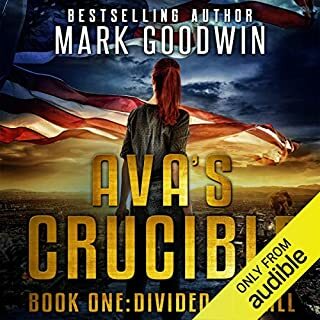 America is on the verge of a second civil war, and Ava must pull it together if she wants to survive. Violent protest, widespread destruction, and politicians who insist on letting the disassociated vent their rage will bring America to her knees, threatening to decapitate the laws, principles, and values on which the country was founded. Ava refuses to give into fear, but she simply cannot survive on her own. She must deal with her crisis of faith and learn to trust other people, or she’ll never make it through the bloodiest period of America’s history. I would have appreciated the same content if it had preached less and showed via the storyline it's plot, mission, and theme. The preachy approach made it unbelievable. I do like dystopian fiction and respect the US constitution, but this book was boring. Would you try another book from Thomas Nelson, Inc. and/or the narrators? Here's the scoop on the good, bad, and solutions to the latter. 1. There are 17 separate books that download together on the Kindle. All have the exact same cover graphic. Once played, their progressive order becomes randomly scrambled.The fix for this is for Audible to place a number on the cover to indicate the Audible books' progression.2. Similarly, the chapter listings are indicated only by numbers. This makes it difficult to look up a desired passage. In addition to the chapter numbers, Audible should include the title of each chapter with verbiage representing said chapter as is done in a textual bible. The Chapters can be viewed by clicking on the blue Chapters link. 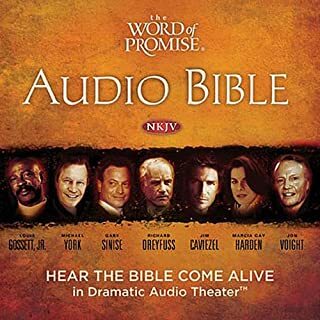 Has The Word of Promise Complete Audio Bible: NKJV turned you off from other books in this genre? Pursuing my interest in sacred medicinal plants and essential oils in the Bible, I want to better understand their use in context. I will go on to read more books related to this topic armed with a superficial, contextual understanding. I do not have a favorite scene. However, I thought the narrations were outstanding. Although some have reported that the sound effects and music were distracting, I found them to support the narrative and mark changes in chapters. I appreciated their use. Did The Word of Promise Complete Audio Bible: NKJV inspire you to do anything? I will listen to it several more times. I'm somewhat taken back by God's lack of disapproval for polygamy and slavery. I take offense to the naming a litany of only male descendants. Now, I can better appreciate why and how the Judeo Christian part of the world has embraced so much war, violence, and treachery. If I were rating this, I'd give it an R as it needs parental supervision. The club comes first. I've lived by those words my whole life - assumed I'd die by them, too, and I never had a problem with that. My Reaper brothers took my back and I took theirs, and it was enough. Then I met her. Tinker Garrett. She's beautiful, she's loyal, and she works so damned hard it scares me sometimes. She deserves a good man - one better than me. I can't take of her yet, because the club still needs me. There's another woman, another job, another fight just ahead. It would depend on the friend. Most of my friends are childless by choice and the story-line makes too big of a deal of "mommydom." Most of these friends would find this theme something they do not relate to and boring. I found the story-line to be original, believable and not excessively violent. 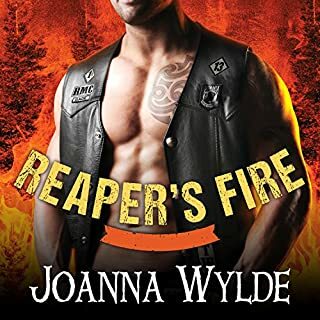 Has Reaper's Fire turned you off from other books in this genre? Which character – as performed by Sean Crisden and Tatiana Sokolov – was your favorite? Tink's dad. He seemed to be the type of person who tried to take care of himself, not burden others, and was open minded. Not really. I'd like to see these books tackle issues that are plaguing our country i.e. unemployment, broken health care system, cause (military) and threat of nuclear energy. I'd like to see books put forth potential solutions to these problems as part of their story-lines. I would like to find a series of motorcycle romance or dystopian fiction books that dealt with ecological defense and/or political intrigue a la changing state's laws or constitutions to allow medical marijuana, invoke 12 year term limits for lawmakers, and/or hold lawmakers and judges accountable so they could be sued civilly for negligent, harmful laws and decisions respectively. I'd like to see both types of series utilizing remote viewing to accomplish this. Sometimes you don't mean to become another person. Sometimes the choice is made for you, and pretending is the only thing that keeps you going. When Alexis Romera is taken and her kidnappers find her fake ID in her purse, she must become Sophia in order to keep her family safe. Revealing her real identity to the man she's sold to would be easy enough, but can she trust him? 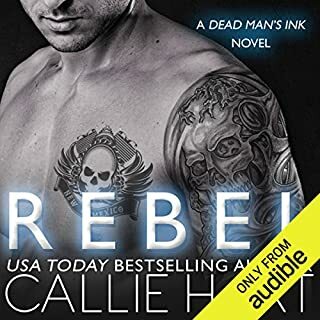 Hell-bent on avenging the murder of his uncle, Rebel doesn't seem all that interested in playing things safe. What made the experience of listening to Rebel the most enjoyable? The author is a master of descriptive writing making her characters come alive with realism that I rarely if ever encountered in the MC genre. This is not a cozy book but more of a thriller without a litany of gun violence. I'm sooo tired of bang bang shoot em ups. The violence supported the realism of the storyline and was not included for its own sake. Although involving some romance, it was well placed, at the end, and did not carry the story. Surprisingly, the book dealt with some pretty serious, real subjects to include human trafficking not often encountered in this genre. I also enjoyed the concept of a egalitarian motorcycle club which included all races and women as members. This club's set up was not like that of a feudal lord and king thing.The narrator's accents, to include Spainish and southern gentleman, as well as her intonations were spot on. What was one of the most memorable moments of Rebel? The most enjoyable part was Sophia, alias, and Rebel's trip to his father's mansion in Alabama. Have you listened to any of Walles Hamonde and Kelly Burke ’s other performances before? How does this one compare? I did listen to it in one day as I was ill with a serious cold and this was a perfect diversion. It definitely gained and maintained my interest. Once I started it, I did not want to stop. I'm looking forward to more stories in this series and will try some of the author's other books. This author is truly gifted. Emerging science is showing that cholesterol levels are a poor predictor of heart disease and that standard prescriptions for lowering it, such as ineffective low-fat/high-carb diets and serious, side-effect-causing statin drugs, obscure the real causes of heart disease. Even doctors at leading institutions have been misled for years based on creative reporting of research results from pharmaceutical companies intent on supporting the $31-billion-a-year cholesterol-lowering drug industry. What made the experience of listening to The Great Cholesterol Myth the most enjoyable? I wouldn't say this was as enjoyable as it was interesting, need to know information presented in an easy to understand manner. I found it interesting because it related directly to my problem. Refreshingly, it was truly evidence based medicine at its best because it included common sense and not simply a reiteration of the cholesterol hypotheses that I've come to realize is more myth dependent then anything else. This book deals with strategies for attaining and maintaining heart health. I need to know this information because I have lived by the health education books... eating mostly veggies, fruits, chicken, and salmon. Wheat and milk products did not agree with me so I pretty much stayed away from them. But my cholesterol and LP(a) were very high. This book provided me the information and insight into why. Other docs pushed it off on my genes but neither parent had the problems I have, and they both ate boatloads of steak, eggs, etc. I maintained their minimally processed food lifestyle with some variations. I avoided red meat; minimized dairy consuming some low or no fat varieties; consumed minimal wheat products and no sodas. Sadly, I did consume excessive amounts of sugar. Sugar... because I've come to realize how seriously he's affected my life, in a bad way, and now I realize I'll have to leave him forever or suffer the consequences which could be heart ache or worse-- a heart attack. (The latter is true) For me, cutting down on sugar was the big take away message.All kidding aside, I've come to realize that sugar causes inflammation and for many reasons this is a very bad thing. In addition to learning about the profound, negative effects of sugar, the authors have presented many innovative strategies and supplements to help one improve their heart health. They explain why they work and how to best take advantage of them. Although I was familiar with most, I took notes during this section and will add a few to my repertoire of supplements.This book promotes a well rounded, minimally processed diet. It advocates avoiding sugar, breads, and cake-like products. It does embrace eating fresh fruits and vegetables as well as steel cut or real oatmeal, not the instant type which is processed. This book advocates eating grass fed beef and wlld caught Alaskan salmon as well as dairy products from grass fed livestock. Of course it supports maintaining a healthy weight and getting daily exercise. Again, the authors address the whys of each suggestion which I found quite compelling. My favorite section of the book was the supplement section as it gave me direction as to what to do about my specific, less known, heart health concerns...LP(a). It would be great if this book could be made into a documentary and aired on Netflix. This is a must read for anyone who wants to attain and maintain a healthy heart. It delves into causes for high cholesterol that are not widely known or understood i.e. sugar. This book focuses on what's really of concern when it comes to heart health threats i.e. high LP(a), fibrinogen, C reactive protein, triglyceride levels, and more. I couldn't take statins and had a very bad reaction to them i.e. dizziness, exhaustion, falling, and debilitating forgetfulness. I'm very lucky I did not break a hip as I fell daily and couldn't remember drive routes. From the statins, I suffered from leg cramps that developed into semi permanent muscle spasms that a massage therapist finally worked out. With the exception of the latter, all problems dissipated when I dropped the statins and took niacin instead. Yep, I got the flush but realized it was a small price to pay to be off of the statins. This book addresses the effectiveness of niacin... thank you very much.. My condition has undoubtedly been exacerbated by statins and docs that ascribe to a one size fits all methodology. This one two punch, resulting in extreme distress, has taken it's toll. It's a wonder I haven't had a heart attack from it-- whatever happened to the axiom of, "do no harm"? Thanks to integrative books like this, I never had a heart attack. 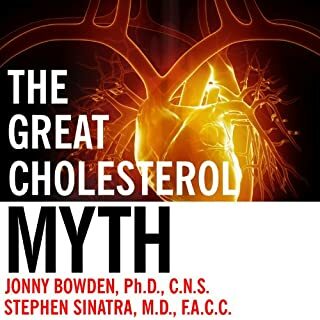 In this book, Dr. Sinatra and Dr. Johnny do not push statins. They suggest a multifaceted approach and a plethora of other remedies, from herbs to supplements, and healthful life style habits, from exercise to meditation. I can relate to, appreciate, and embrace this strategy taking away that which applies and will work for me.I rarely listen to books twice. This is one I will listen to at least twice. It is 2041. Mankind has pushed his planet from rapid climate change to the brink of nuclear holocaust. In the midst of the chaos, brilliant young scientists Jon Castel and Levi Clarke discover new data that suggests the situation is far more dire than anyone could have predicted. Soon after, the President forms a task force bent on taking drastic action against the impending doom. Through Jon's leadership, the task force determines that the best possible hope for mankind is to begin colonizing the moon, and eventually, Mars. Where does Warned rank among all the audiobooks you’ve listened to so far? This is one of the better books I've listened to. I did not care for the narrator who was the author, but the story was one I could not turn off. Thanks to my Kindle Fire, I listened to it all day. This book dealt with a wide variety of topics including over population; global warming; solar flares; melting ice caps; the importance of our space program to humankind's continued existence; the waste of money and resources on the military in light of potential global catastrophes (real threats), terraforming Mars; the new physics, God, demi gods,and alien life forms; positive and negative aspects of technology, the cost and danger of nuclear waste; and potential solutions to today's problems. The story line was well paced with adequate character development. This is a book that I will think about for a long time to come and anticipate listening to again. What other book might you compare Warned to and why? 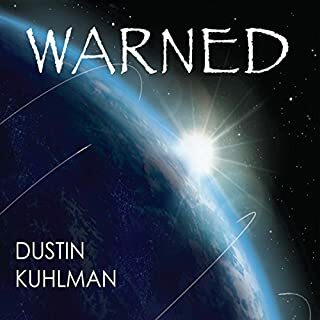 Warned is dystopian SciFi similar to the books "When the World's Collide" and "After the World's Collide." The underlying profound philosophical concepts are reminiscent of the Star Trek TV series and movies. The author narrator writes much better then he narrates. This book should be re-narrated by a seasoned Audible narrator. It is an outstanding book. The narrator read it without changing his voice to represent various characters. He has a halting rather then flowing reading style. To his credit, he annunciates words well and is easy to understand. I appreciate and applaud his effort. Does hands-on healing work and can it be taught? Like many scientists, Dr. William Bengston would once have dismissed this phenomenon as an example of power of suggestion. 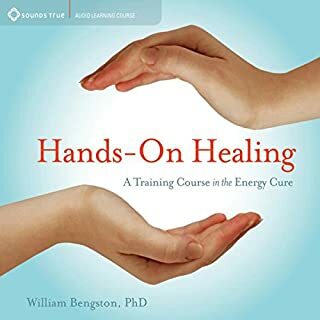 But after 35 years of extraordinary research, Dr. Bengston has demonstrated time and again that hands-on healing works-even on some conditions that have no conventional treatment. Although the author does not know how or why it works, he provides an interesting story about how he came upon a technique which seems to cure some diseases. He backs this up with statistical studies conducted through reputable, accredited universities. Unfortunately, he has not been successful in securing major grant funding. This is truly sad. He outlines and then provides practice in the technique which he refers to as "cycling." It's a process of cycling thoughts rapidly in one's mind. I was so impressed with the contents of this book that I listened to it twice... once by myself and once with my husband. I've recommended it to several of my friends. Yep, I got hooked on Twilight after seeing the movie and raced through all the audio books wanting more. A longtime Sci Fi fan, I thought vampire media was all horror and beneath me- wrong. I do like this new romance vampire genre, and the Sookie Stackhouse books filled the void. 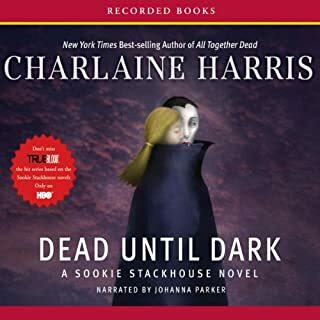 Dead Until Dark Book 1 of the Sookie Stackhouse series is great. It has just the right ingredients- mystery; fantasy (vampires, shapeshifters, and werewolves oh my;) with a dash of steamy romance. The character development is outstanding with a realistic style that pulls me along. The excellent narration, with it's Southern drawl and readily discernable characters brings the scenes to life. It's an action packed plot that doesn't telegraph the ending. Warning... once I started this series, I could not stop. It's addictive.